Our wake up call was for 3:30am and the word was, "We are on a very tight schedule–be at the bus by 4AM or get left behind." No one was late. The city of Bethlehem is quiet at 4AM, and the streets of the Old City of Jerusalem are deserted, except for security guards and a cleric or sister. 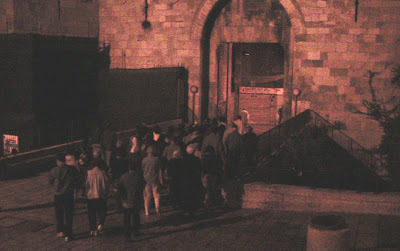 The many shops are shuttered ... we were in a world by ourselves as we made our way up the ramp and thru the gates of the Old City of Jerusalem. We made our way carefully, walking across the ancient stones that have felt the feet of so many Pilgrims on this Journey of Faith. What an awesome privilege to be in this place, in this hour of the day, walking where Jesus walked on the road to Calvary. In the semi-darkness, Fr. Anthony﻿ Romero led us in the Way of the Cross. "We adore you, O Christ, and we praise you" he intoned, and we responded, "because by your cross you have redeemed the world." 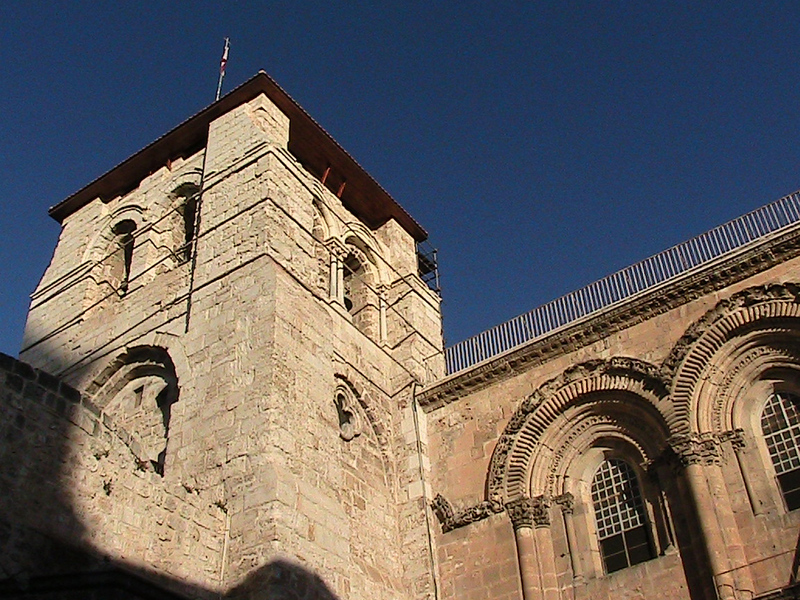 With each Station we moved closer to the Church of the Holy Sepulchre. Fr. Anthony Romero is the man with Deacon Don's hand on his sholder. Mass was scheduled to take place IN the Holy Sepulchre–the slab where Jesus' body once laid in death becomes the altar and there is only enough room for the priests and deacon–the rest of us were able to go in two-by-two briefly and then yield the place to others. Also on this altar, in a zip-lock bag, were the prayer requests that IHM parishioners had given us, and a bag of rosaries made by one of our pilgrims. 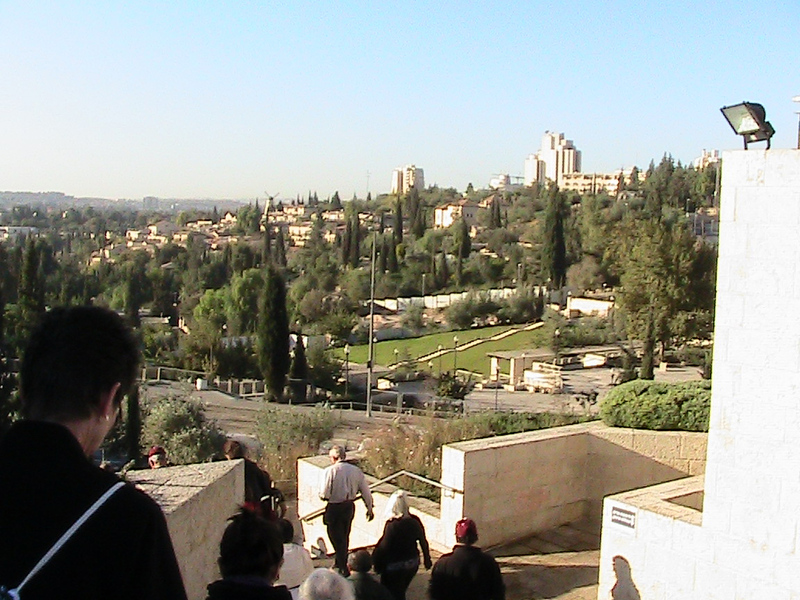 We each carried with us wooden crosses that were gifts from our tour guide and bus driver, George and Issam. What wonderful men of God–they strive to take good care of us! By the time the Mass was ended the Church of the Holy Sephulchre was becoming congested with other early morning Pilgrims, and with a peale of bells and the glorious sounds of the pipe organ, a Roman Catholic High Mass began in the main sanctuary. 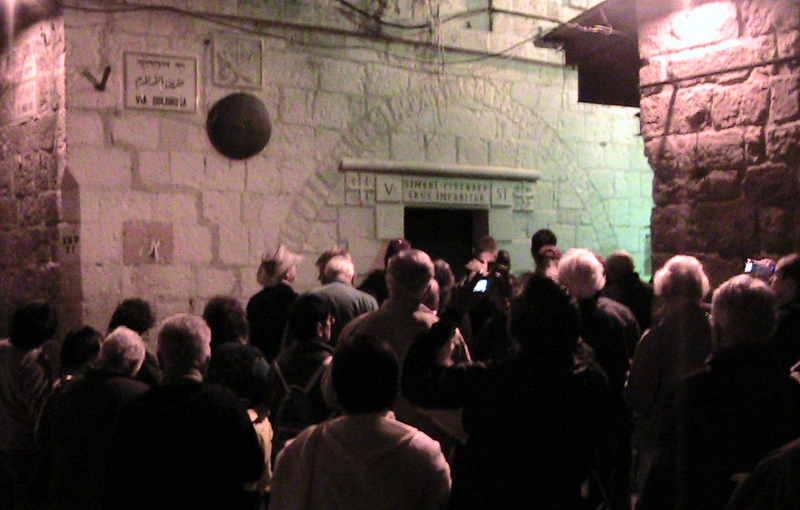 We paused to take a formal group picture and then made our way back outside, yielding our places to the growing number of other pilgrims anxious to enter this holy place. The sun now revealed the beauty of this ancient but earthquake-damaged building. In the light of this new dawn, we paused to reflect on what we had just experienced. Then we roused ourselves and began the wait for the bus. In the picture below, many are looking at the group picture that we had taken only moments before. 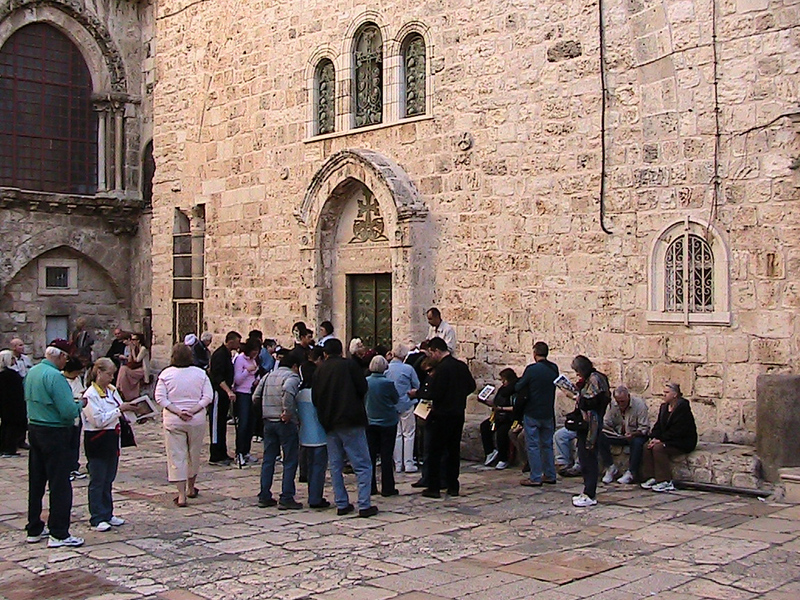 They will be life-long momentos of a precious gift–on this day in 2010, we were favored to celebrate Mass in the Holy Sepulchre. Reluctantly, we began to make our way back to the gate and the city walls. The light of Jerusalem's early morning reveals the beauty of this place. A little tired now and certainly hungry, we made our way back into the busy-ness that is modern Jerusalem on a Tuesday workday, and on to breakfast. What a way to start a day! May God bless you this day as he has blessed us! P.S. Today is only half over–"Part 2" of Nov. 9th the follow!